Friday Wrap-Up – News from Celtic Knot, Big Axe, Rudder’s Brew Pub, Bad Apple, BarNone, Sea Level, Pump House, Shiretown, and more! • Celtic Knot Brewing announced that they have ordered three more 102 L fermentors to keep up with demand for their beers. Currently on tap at Marky’s Laundromat and The Tide and Boar in Moncton, as well as Ducky’s in Sackville, obviously beer drinkers are enjoying what Celtic Knot has been brewing! Their recently-brewed Session IPA, For Shore, featuring New Zealand and Australian hops, should also be appearing soon; for more info on that beer, check out our previous post. • Big Axe Brewery has added yet another new beer to their line-up… Shakesbeer Chocolate Oatmeal Stout (named after owners Peter and Tatiana Cole’s chocolate labrador dog, Shakespeare) comes in at 6% ABV and is described as a “full and silky-bodied stout”, with an aroma “rich in caramel malts, chocolate, and hints of vanilla”. With a roasty and earthy hop character in the flavor, the beer is now available for growler fills at the brewery in Nackawic. And if you’re in the Sackville area, you can now find Big Axe beer on tap at Ducky’s; their Chanterelle Cream Ale was just tapped this week! • It’s been out for a little while, but we wanted to share full details on Yarmouth’s Rudder’s Brew Pub’s latest seasonal beer. Brewmaster Mike Ferguson has brewed up Bunkers Island IPA, named after the peninsula in Yarmouth Harbour where an Irving Oil bunker oil tank farm was located. This Black IPA was hopped using Southern Cross exclusively, by means of five additions all added late in the boil, for a big aroma and flavour blast, and light on calculated bitterness. A generous portion of Midnight Wheat was used to generate the dark hue characteristic of this style. The beer weighs in at 6.3% ABV and 42 IBUs, and is available on tap and growlers and squealers at the pub. If you’re headed to or from Portland, Maine, on the ferry, be sure to drop by for a pint! • Bad Apple Brewhouse in Somerset, NS, has released their newest beer, The Impresser Double IPA. This massive beer weighs in at 10.2% ABV, and 300 calculated IBUs, thanks to generous hopping throughout the entire process, from using Chinook flowers in the mash, of course lots of hops (including Citra) throughout the boil, and again dry hopped in the fermentation and conditioning tanks. The powerhouse Conan yeast was used to tear through the high-test wort, and will only enhance the hop flavours and aromas with its signature characteristics. The Impresser is available now in Squealers only at the brewery, and may make it on tap at your local watering hole, but will not last long, so jump on it now! • Coming soon from Bad Apple Brewhouse is their Mosaic Double IPA. Brewed with a generous dose of the Mosaic hop varietal, this beer was brewed to raise awareness of Mosaic Down Syndrome. Donations from the sale of the beer will be made to the Nova Scotia Down Syndrome Society, as well as to Brigadoon Village, who run camps throughout the summer, including a camp over the Father’s Day weekend for families with children with Down Syndrome. This 8% ABV, 120 calculated IBU beer will be released at the beginning of June. • We now have some more details on the new seasonal, Summer Solstice, brewed by BarNone a couple of weeks ago. Designed to respect the longest day of the year, and to celebrate the sun, it’s an unfiltered, moderately-hopped ale that is brewed with several varieties of hops, and dry-hopped with Citra (also the dominant variety in the beer). It weighs in at 4.8% ABV and slightly hoppier than the Summer Sessions. It made its debut last evening at BarNone’s weekly growler night (every Thursday from 6 – 8 pm), with positive feedback from customers, according to co-owner/brewer Don Campbell. Last night also featured some delegates from Ireland and live local music. BarNone has also announced that they’ve brewed a collaboration beer with Bicycle Craft Brewery from Ottawa; that beer was just kegged earlier this week. We’ll have more details on the beer in next week’s Wrap-Up! • Garrison Brewing has announced a special Twelve Cask Bar Top Takeover event at Stillwell Beer Bar on June 21st. Featuring a dozen one-off cask conditioned beers, and highlighting local ingredients, this will be a great event. The day is divided in two: the First Sips event starts at noon, with $10 tickets getting you a special glass and first pour, and these limited number of tickets are available directly from Stillwell. Starting at two, the doors will open again, and as the first wave of folks get their fill, general entry will be on a first-come, first-served basis (for the same $10 deal). We got an inside scoop as to the great beers that will be making an appearance on the 21st: Brewer Kellye Robertson made her first pin a Blueberry Wheat Chai Tea using Oxford Blueberries & Chai from The Tea Brewery in Mahone Bay. We’ll have more details on beer in the coming weeks, so stay tuned! • Also from Garrison, a brand new beer! Building on the feedback and popularity of their Test Batch beers, they are releasing an India Pale Ale. Weighing in at 6.5% ABV and 50 IBUs, Waimea, Citra, Columbus and Amarillo hops lend the beer a citrus and tropical fruit aroma to balance the malt backbone. It is available now in 6-pack format at the brewery, and will soon be in the NSLC and private beer stores. It is joined by a re-release of the the ever-popular NiTWiT Belgian-style Wheat Ale, which started off life as the 2010 Home Brew-off winning beer. The beer weighs in at 4.8% ABV and 12 IBUs, and true to the Witbier style, was brewed with coriander, and offers a orange and tropical fruit aroma from the special yeast. • Sea Level Brewing in Port Williams, NS, has released their very popular seasonal Apple Blossom Ale this week. Brewed with pilsner malt and Nelson Sauvin hops, this beer is infused with fresh Valley apples. The beer is 4.8% ABV, and lightly hopped. Brewed as a celebration of the 82nd Annual Annapolis Valley Apple Blossom Festival, being held May 28-June 2, the beer is currently on tap at the Port Pub, in growlers and cans at the brewery today, and early next week in cans in Halifax, and on tap at select spots around the province. • Last week, we mentioned that Pump House will be releasing a new IPA in six-packs at the end of this month, to coincide with the Atlantic Beer Festival on May 31st in Moncton. In related Pump House IPA news, they are looking for a catchy name for their Draft IPA, and they’re holding a contest requesting some help! If you have an idea for a great IPA name, post it to their Facebook page, and you could win a pizza party for four at the brewery, which includes two pitchers of the new beer. • If you’re a fan of Shiretown‘s Big Brown Ale (currently at the brewery for growler fills, and on tap at select accounts in New Brunswick), good news! They’ve confirmed that it should be available in bottles at ANBL stores in the near future. No official date yet, but expect to see it sometime this year. Coming in at 5% ABV and 28 IBUs, the brewery describes it as “malty, roasty, and chocolatey, with a nice bit of bitterness and a big mouthfeel”. • Tickets to Picaroons‘ Brewer’s Bash beer festival went on sale earlier this week, and a few more details on the event have trickled in. The $25 ticket price gets you a 5 oz tasting mug, and eight beer tickets; additional tickets are $1 each. Like last year, the event will be all day from 11 am – 11 pm, and you can come and go as you please. Expect several food options, live music, and a heck of a lot of beer from breweries all across Canada. Once we find out more details on that end, we’ll be sure to let you know! And keep in mind, they’re still looking for volunteers… shoot them an email if you’re interested. • The King Street Ale House in Fredericton is hosting another beer and food pairing, this time featuring Quebec brewery Unibroue. Featuring five courses from Chef Aaron Fraser, and five different Unibroue beers (including their popular anniversary beer, 17 Grande Réserve), tickets are $65 and can be purchased online. It all takes place next Wednesday, May 28th, from 6:30 pm – 9:00 pm. And just before that event (3-4:30pm), Beer Sommelier Sylvain Bouchard of Unibroue will be hosting a free tasting at the York Street ANBL location. There are a limited number of seats, so RSVP today. • Moncton’s Tide and Boar Gastropub will be hosting a special visitor from Trou du Diable next Thursday, May 29th. In the province for the Canadian Brewing Awards, Isaac Tremblay from the brewery will be on hand to pour a keg or two of their beer (including MacTavish in Memoriam Pale Ale), as well as having some special bottles for purchase. No tickets necessary, just drop by to say hello, grab a pint, and chat about beer! • Big Tide Brewpub in Saint John, NB, recently released Fogbound Hemp Pale Ale. An original recipe of theirs, this is a West Coast style Pale Ale, weighing in at 5% ABV and 50 IBUs, thanks to Cascade and Tradition hop varietals. 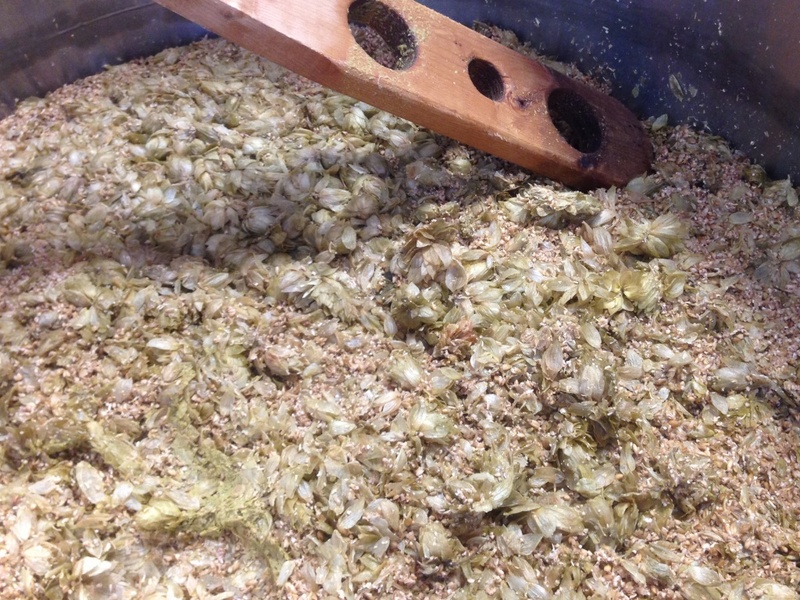 Hemp oil was used during the brew, imparting a lovely nutty flavour to complement the big hop aroma. It is on tap and available in growlers now. Speaking of growlers, they have lifted the temporary weekly limit on growler sales, as they were were having a bit of trouble keeping the beer on tap. Great news, be sure and drop by this weekend to celebrate! • Rockbottom Brewpub has announced that the very popular Thulsa Doom Double IPA has run out, however they are rewarding their fans with a very special 20L pin of Oak-Aged Double Hoppelganger. This 10% ABV beer was first released in August 2013, but has been cellared with love and care by Brewmaster Greg Nash, and it will be interesting to see the changes in the beer over time. On tap soon will be HaliLager a Euro-style lager at 4.5% ABV brewed with Hersbrucker and Cascade hops to 17 IBU. Crispy. • Unfortunately, the Ladies Beer League / Noble Grape Home Brew Workshops scheduled for this weekend and June have been postponed until July. Scheduling conflicts are to blame, but fear not, ticket holders will be reimbursed, and will have first dibs on tickets for the next Workshop. Stay tuned here for more details. Stay tuned, too, for details on the next LBL special event, to celebrate their first anniversary. We know it’ll be a fun one! Phew, that was a long one today! As the weather improves and folks are hitting the decks and patios, as well as a few new breweries opening in our region, we’re sure the good beer news will keep on flowing in! Thanks for joining us this week, and until next week, Cheers! Late addition: We were overwhelmed with stories this week, and totally forgot to announce the random lucky winner of tickets to next weekend’s 2014 Atlantic Beer Festival. Congratulations to the crew from the Drink N Brew blog! We’ll be in touch to give you details. We’ll be starting another contest next week, so stay tuned.